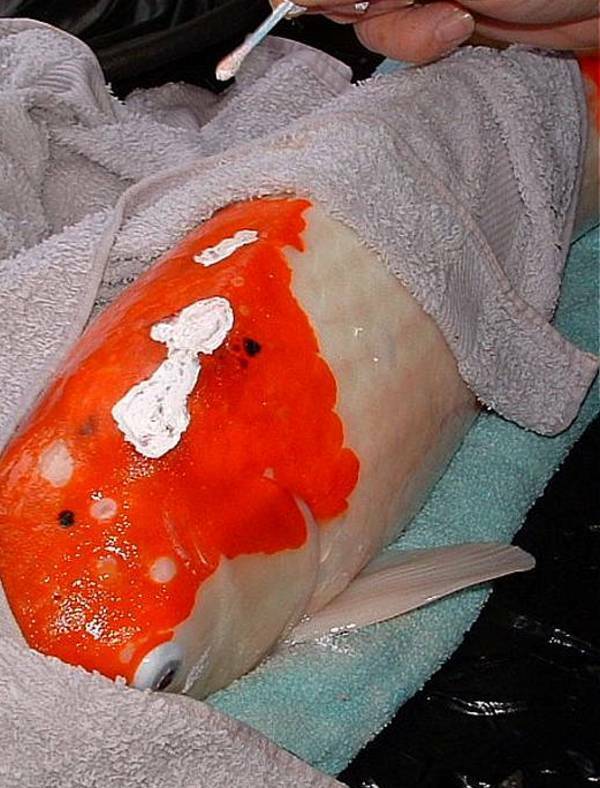 If a koi hobbyist keeps go-sanke long enough it only a matter of time before he/she comes across the skin disease called Hikui. 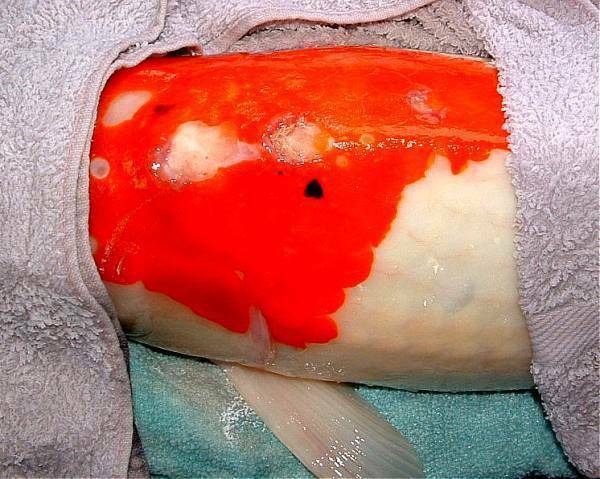 Hikui is a skin ailment that affects the Hi or red colour on a koi and only the Hi. 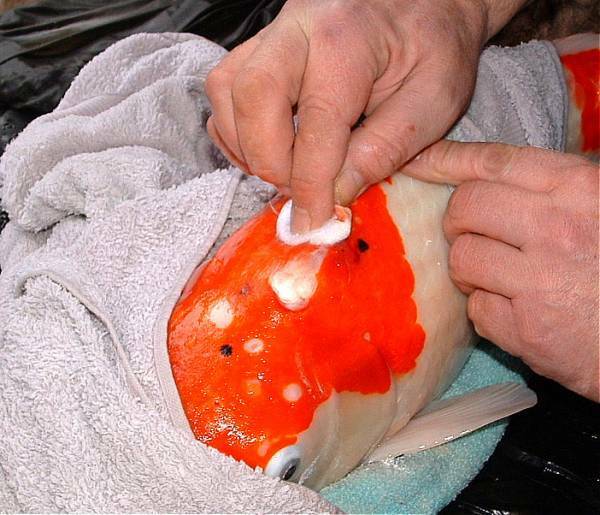 Typically if caught early it displays an orange/yellow colour blemish on the skin, if left it will eat right through the Hi till its gone and white is exposed, as is the case in the example contained here in. Scientific research has not pin pointed the cause of this disease but research has found cancer type cells contained in samples of Hikui, but it is not proven at this time that has anything to do with the disease and speculation continues with cause being listed as bacterial or viral as well as it being a form of cancer, but as said non of this is proven. 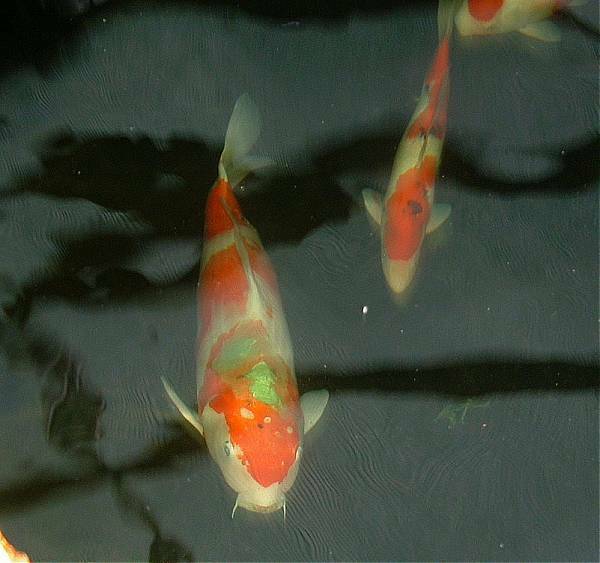 Some Japanese breeders believe it to be hereditary and if a breeding pair start producing off spring that display Hikui they will n o longer breed from that pair. This article is not to debate the reasons for the disease Hikui but to offer a cure for it, I hasten to say this not the only cure out there but one that the author has good success with and is relatively cheap and requires no real expertise. 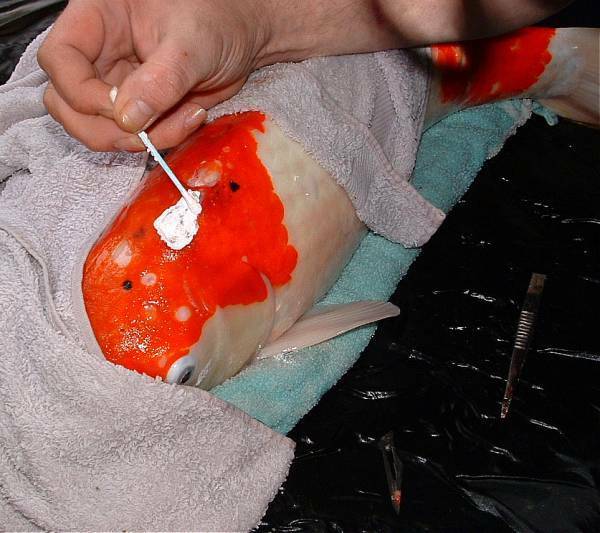 You will notice that the first area, the Hi has indeed been eaten away, while the two other areas are displaying the typical yellow/ orange sores that are more usual with this disease. 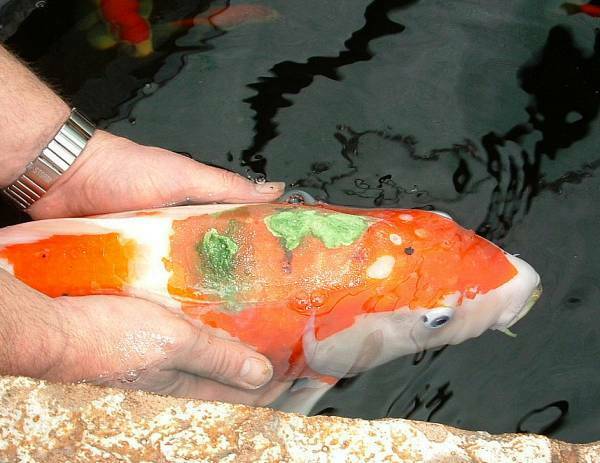 After sedating the koi, the first thing to do is a good clean up of the area, with any dead or dying scales to being removed and apply rocal or similar to help with the task of cleansing. 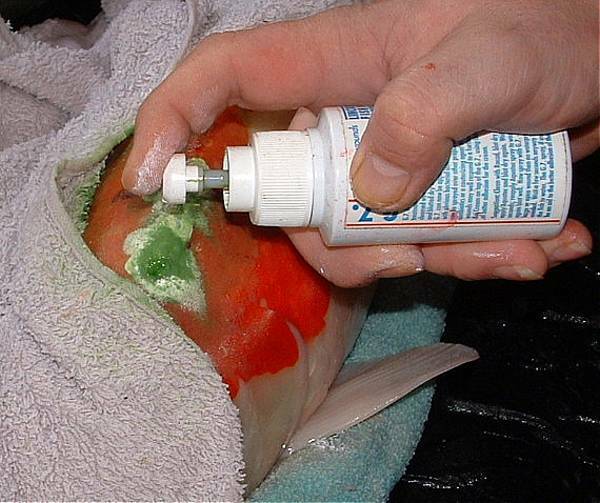 Once dry start applying the Cauteriser with a cotton bud taking care not to overlap, as this will bleach the area of some of the colour. Allow to dry well you could use you hair dryer for this again set on cold being careful with the electrics. 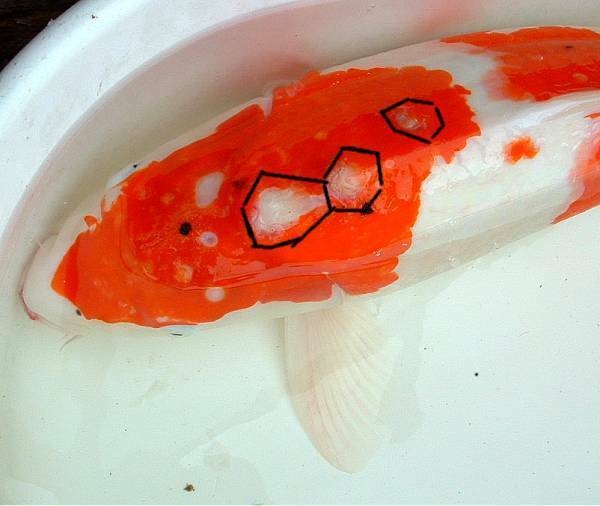 Cauteriser is available from Paula Reynolds at Lincolnshire koi health priced at around £5/6 a pot and will lasts for years. 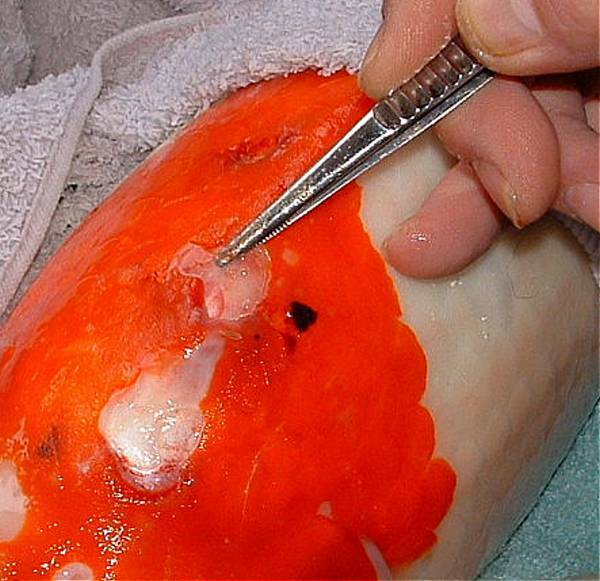 Cauteriser was not made for Hikui that was the author’s adaptation, it was made for mouth rot and fin rot and just about anywhere you would normally put Potassium permanganate paste, whilst great care should be taken not to get it in contact with delicate areas such as gills, this Cauteriser is not as aggressive as PP paste. 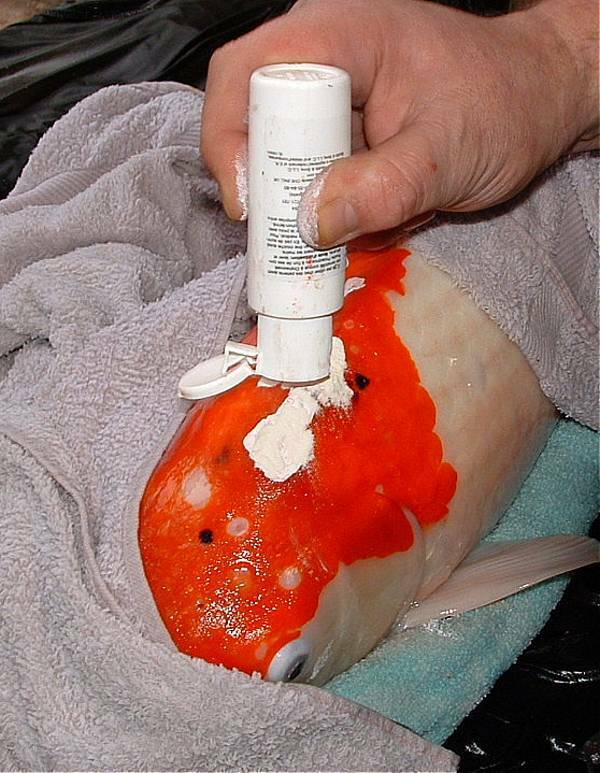 G7 sealer is also available from Linc’s koi health at around £7/8 and again has more than one application. 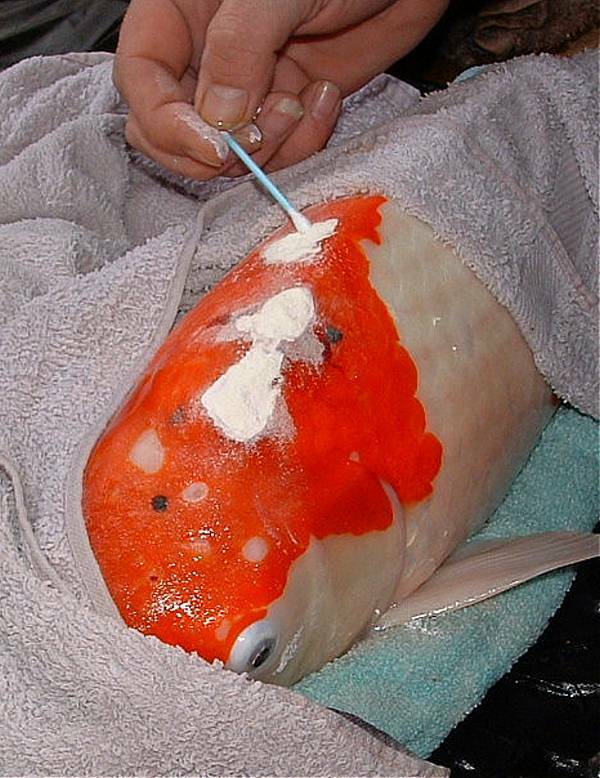 Oraheasive powder was made for weeping cuts ETC, in humans and is available from your pharmacy over the counter (non prescription) although may have to be ordered. or from Kusuri products 25 gm £5, again this stuff goes a long way.